The seconds had a strong lineup for this home league game despite some late changes – Lauchlan McCall had been called up for the first team and Stevie Grant was unavailable in the front row – which gave the opportunity for Hasan Gulam Ilter to start at tight head. The backs looked impressive with James Timlin back at standoff, Jeff Martin and Ally Walker in the centre and Ross Tulloch back in the 2s after his first team scoring debut the previous week. The referee who was being assessed and appeared keen to impress the observers penalised Linlithgow for a succession of needless penalties and that gave Forrester the opportunity for an early shot at goal. They converted this and the score was 3-0 to the visitors. This stung Linlithgow into action and a good break by Murray Smith and Jeff Martin ended with a line-out on the Forrester goal line. A good drive from the forwards ended with a ruck near the line and the ball was eventually touched down by Hasan Gulam Ilter with his first try for the Reds. Jeff Martin missed the conversion. 5-3 to the home team. Forrester came storming back and a nice switch ball outside the Reds 22 ended up with the Forrester centre scoring a nice try which was converted, 5-10 to the visitors. The Reds were stung into action again and good play by a succession of forwards where Duncan McClymont, Connall Black and Hasan were all to the fore set up a good ball which Robbie Thomson, whipped to James Timlin, Jeff Martin made a break and Ross Tulloch supported on his shoulder dummied the winger and strode below the posts, converted by Martin, 12-10 to the Reds. The forwards now were setting the ball up well and Robbie Thomson was getting the ball away quickly, giving the backs time and room to run which this suited our young backs, and before long Cammy Walker and Murray Smith had added two more tries, converted by Jeff Martin. The score at half time was 26-10 to the Reds and the Manager was pleased with the improvement in performance. Unfortunately Stu Young was given an extra break for some nifty footwork on an opposition player which annoyed the referee, Stu of course denies that he was in the wrong and was the victim of a miscarriage of justice which takes place every week!!!!!!!. The game restarted after half time with Reds continuing in the good form of the first half. 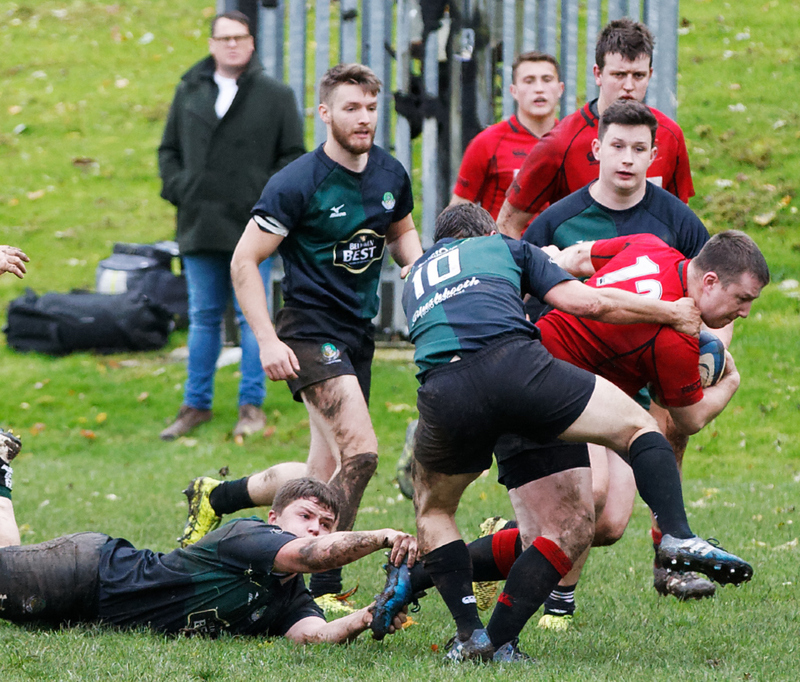 The young forwards of Callum Forbes and Matthew Sommerville were assisting Duncan McClymont and PJ Singleton in assuring that the Forrester pack were frustrated in their pick up and drive approach by tackling everything ferociously. Before long a turnover took place and the ball came out to the backs where Murray Smith finished off a good move to score his second try, converted by Martin. 33-10 to the Reds. The backs and forwards now believed they were capable of scoring more tries and James Timlin glided in for a score without a hand been laid on him, converted by Martin. The score was now 43-10 to the Reds and they were in complete control of the game. The Forrester stand off in his frustration decided to attempt a kick pass inside his own 22 to a winger who unfortunately was not on the same wave length as him. The ball was plucked from the air by Cammy Walker who sidestepped his opposite number and ran outside the full back to score his second try. 50-10 to the Reds. This was a great result over a team who had only slipped up once briefly in their previous games and fancied themselves as potential table toppers. The Reds now sit in that position and if they keep up this level of performance the Manager believes they will be there or there about at the end of the season.